The fishermen of Lake Chad must sail in secret, forced to evade both Boko Haram jihadists and Nigeria’s military in a desperate dance that has strangled livelihoods and caused scarcity of a once-staple food. While in the past boats slid across the vast waters unhindered, sustaining a vibrant fishing industry in northeastern Nigeria, years of bloody Boko Haram militancy has deeply scarred the region. 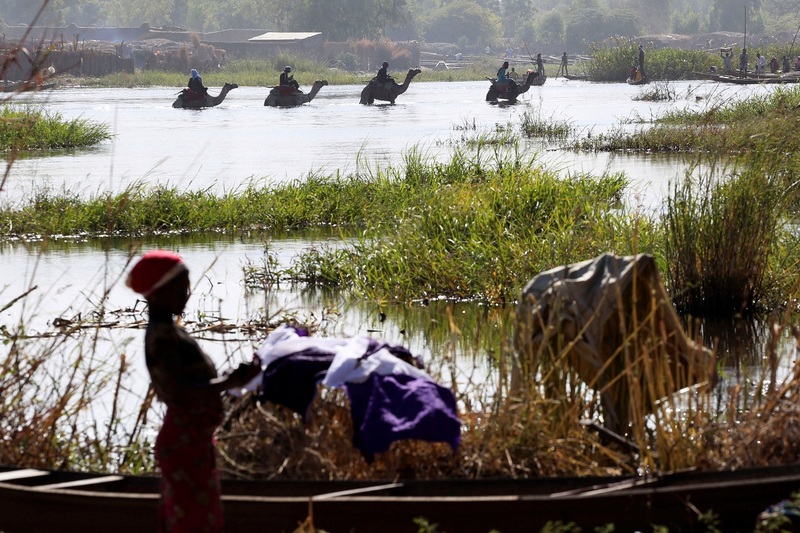 And despite a brief return to stability earlier this year, the fishermen have become ensnared in a fresh Nigerian army counterinsurgency operation against the jihadists in and around the lake launched in May. For Aminu Mohammed, that means “no fishing, no selling fish,” until the end of August, the date when “Operation Last Hold” is set to end. But he goes anyway, forced to disregard the rules — and risk encountering the jihadists — in order to survive and feed his six children. The danger is immense. “Boko Haram lurks on the lake and when they do not kill us they take 10,000 naira ($27, 23 euros) to allow us to fish,” the 45-year-old told AFP. There is also a threat of arrest by the Nigerian army, who have detained fishermen in the region and accused them of financing the jihadists by paying them taxes. The once-teeming fish market at Maiduguri, the capital of Borno state and major trading hub some 200 kilometres (125 miles) from Lake Chad, looks abandoned after nine years of bloody conflict. Most stalls are empty, their owners, Hausa and Kanuri traders who have made their fortune there for centuries, have left to buy fish at the Cameroon border. Yakubu Dangombe is one of the few to remain, yet business has never been harder. Dangombe said he had two million naira of fish stuck on the road in Baga, the main fishing hub on the Nigerian side of the lake, blocked by soldiers. “I have 35 children, I can’t feed them or pay school fees, it’s a disaster,” says the once rich trader. To avoid the military, traders smuggle the fish into Maiduguri by road in bundles of 10 or 30 kilograms stashed in cars and “under travellers’ suitcases”, said a salesman under condition of anonymity. Still, not enough fish gets in to meet demand. The shortage has caused a dramatic spike in fish prices: one pile (seven or eight fish) has surged in the past three months from 4,000 to 10,000 naira. So customers have turned to other sources of protein. In a large yard where men use jerry cans to smoke tilapia and perch, there are some new additions to the menu: monitor lizards and cats. Prior to the conflict, fishing was one of the region’s largest sources of income and employment. The industry produced up to 100,000 tonnes of fish annually and was valued at as much as $220 million at its peak, according to the Food and Agriculture Organization of the United Nations. More than 200 trucks would leave Baga to supply markets all over the country, reaching as far as Lagos and Port Harcourt, Nigeria’s southern megacities. Not anymore. According to the fishing union in Borno, more than 200 fishing towns have been razed by the jihadists since 2009 in their ruthless quest to establish an Islamic state. At the peak of the insurgency between 2013 and 2014 when Boko Haram reigned supreme over the lake — which is bordered by Nigeria, Chad and Niger — authorities from the three nations totally banned fishing in an attempt to cut what was an important supply for the jihadists. The army eventually regained control of most territories, forcing the jihadists to retreat further into the lake, a difficult terrain to access. By 2016, thanks to the official reopening of the Baga market and the resumption of traffic along some key highways of Borno state, it appeared that some normalcy was returning to daily life. But traders now complain that the army and local authorities are acting together to wring money from them. Soldiers are accused of seizing fish stocks transported by road and working with local authorities to collect taxes, which have tripled, according to Assa Yuni, a trader in Maiduguri. But officials say the cost is justified because of the added cost of security escorts. “People would like everything to be like before, but it’s not so simple, you have to pay armed escorts on the road, because the situation is volatile,” said the secretary of the Fish Producers and Marketers Association of Borno state, Mallam Baba Musa. “Whether it’s the military or Boko Haram, we are stuck between a rock and a hard place,” said Dangombe, the trader whose stock is stuck near Baga.